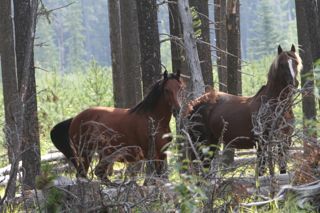 As previously posted WHOAS has two wild horse population management proposals before the ESRD. Both of these took a considerable amount of time to be put together, refined and then submitted to the government for their approval. Both of them would allow for a much more humane way of dealing with management of our wild horses, than have gone on in the past. One of these proposals was an adoption program which would allow WHOAS when and only if necessary remove horses from their natural environment. This would involve older horses and younger that found themselves in trouble having strayed on to private land or being abandoned by their herds. We are progressing well with getting things into place in order to accomplish this. As you can read from other posts, this year we have had to work with more horses than ever before, to gentle and then re-home them. Although it would be nice if this never had to be done, unfortunately it does and will continue to happen. We hope to have a permanent facility up and running by late fall. Probably the most controversial one that WHOAS is supporting is a contraception program that will target a number of wild horse mares each year, using a drug called PZP. What is PZP and how does it work? A non-cellular membrane known as the zone pellucid (ZP) surrounds all mammalian eggs. The ZP consists of several glycopprotiens, one of which is ZP3, which is the molecule which permits attachment of sperm to the egg during fertilization. PZP, a vaccine, not a hormone, is derived from ZP protein of pig ovaries. When this vaccine is injected into the muscle of a target female animal, it stimulates her own immune system to produce antibodies against the vaccine. These antibodies then attach them to the sperm receptors on the females own eggs and thereby block fertilization. A few points here is the process used to obtain this is quite extensive and is done at the Science and Conservation Center in Billings, Montana. A team of three individuals working under strict conditions process the pig ovaries in order to obtain the PZP. One thing also to point out is that no additional pigs are slaughtered to obtain the ovaries that are used, as they come from animals already destined to be processed. How is PZP administered? WHOAS will be using a remote delivery method to inject the targeted mares. The dart gun we will be using is operated by CO2 and has a range from 8-60 yards depending on the settings used. The vaccine itself is mixed with an adjuvant and then inserted into a 1.0cc barbless dart. The dart, when it hits the animal, injects the vaccine and then falls out. For the most part it will be like a bite from a horsefly to the mare. It causes no injury or harm to the animal. It has no debilitating side effects. If the mare is already pregnant, she will be able to carry through with her pregnancy with no negative effects. Following her foaling in the spring, she will not be able to be fertilized by the stallion if she is bred. Furthermore, her female foal will be unaffected and able to reproduce herself upon maturity. For the mare not carrying a foal within her, the vaccine will act as it is supposed to and just prevent fertilization of her eggs by the stallion’s sperm. Breeding will occur but not fertilization, thus the dynamics and functioning of the herd remains intact. This is one of the biggest bonuses of using this vaccine. Herds will not be torn apart and the lead stallion and herd mares will continue to maintain stability of each harem. This in itself assures that indiscriminate breeding of immature mares by young stallions most likely will not occur. A booster shot will be administered to each mare targeted within the next year. This will then give the mare a pregnancy break of up to three years. This vaccine if used in this manner does not make an animal sterile. This pregnancy break has been proven to allow a wild horse mare to build up her body reserves and therefore in the future able to produce healthier foals. Since the vaccine is a protein it breaks down easily and therefore cannot enter the food chain and will not have any negative effects on animals that may prey on a wild horse. It is completely safe for the environment and WHOAS will assure that all darts used are recovered and disposed of properly according to veterinarian protocol. We have heard that some people are concerned that our wild horse genetics would be lost and that this contraception program will negatively affect these. Research done by leading geneticists has shown only the strongest genes are passed on to the next generation as our Alberta wild horses have evolved to survive in their environment. Where rare gene lines are no longer relevant to these horses, they are discarded over time. So the genetics that our Alberta wild horses carry now are the ones that allow them to survive and become the unique and beautiful animals they are today. Isn’t Mother Nature fascinating! As we move forward with this program, WHOAS will not be going into any given area and applying the vaccine indiscriminately. Only a few mares from each area that have already proven their reproduction capability will be given this pregnancy pause. Therefore, again, allowing the social structures and behaviours of our wild horse herds to remain intact. Some opponents want the horses just left alone but that is unrealistic considering all the factors that play a part in the management of all creatures living along the Eastern slopes. Many other stakeholders including ranchers, forestry and recreational users, have to be considered when determining the best method of assuring that our wild horses can and will remain on the landscape. In wild horse herds throughout the United States, even the BLM is abandoning the wholesale capture of their wild horses in certain locations and allowing the contraception program to manage the numbers. In Europe, including the Danube River estuary, where there are over 1,000 wild horses, the PZP program was adopted to allow the survival of the herds but control the numbers. This very humane method works and will prevent, in the future, if given a chance, previously used inhumane methods of removing the wild horses for population control. WHOAS asks for your support in these endeavours to protect your wild horses for future generations. I fully support the contraception method over any other control method. I do hope that other peolpe will agree and this can be started soon instead of the senseless capture and slaughter. Oddly enough this cull that’s going on , has recently had some interesting news about atv trails being developed in the same area and a very large sum of money from the ab gov.